In this article we will cover India as an investment destination, how to figure out if you are an NRI, things to keep in mind when investing in India as an NRI, NRI taxation and which are the different bank accounts to invest from. First, let's consider how to know whether you classify as an NRI or not. The classification is actually very simple. The Income Tax Act classifies residential status of a person into 'Resident' and 'Non-Resident' (NR). It further classifies 'Resident' into 'Ordinarily Resident' (ROR) and 'Not Ordinarily Resident' (RNOR), which is applicable only to Individuals. An individual is 'Resident in India' if he/she fulfils any one of the condition (basic conditions) given below with reference to his/her stay in India during the previous year (i.e. April to March). If he/she is in India in that year for a period or periods amounting in all to 60 days or more and if he/she has within the 4 years preceding that year been in India for a period or periods amounting in all to 365 days or more. There are a couple of exceptions to the above stated conditions. a Citizen of India, or a person of Indian origin, who being outside India, comes on a visit to India in any previous year. Thus, to be resident in India, a person has to satisfy any one of the above two basic conditions. If a person does not satisfy any of the above conditions he/she is determined as 'Non Resident' in India. Once a person is determined to be resident in India, he may further be 'ordinarily' or 'not ordinarily resident' in India. he/she has been in India for a period or periods amounting in all to 730 days or more during 7 years preceding that year. Now that we know how to classify oneself, lets move forward to assess India as an Investment Destination - compared to the other emerging nations. The recent economic down-turn has made a number of Indians working in a foreign country become concerned about their job security and investment options. This has made them think about managing their finances in a better way by taking professional advice and by investing more money in India - their home country. The India Shining story is something we have all heard in the past, but is it really true when compared to other developing nations such as Brazil, China and Russia? 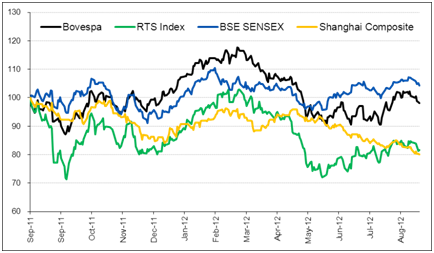 As is shown in the chart above depicting India, Brazil, Russia and China, over the past 1 year, even with all negatives, India has managed to slowly and steadily outperform the rest of the emerging nations, proving that as an investment destination, we need to look no further than our own home country to help us plan for and achieve our life's financial goals. However, deciding which country to invest in is only the beginning. It is important to also know where to invest your money, which account to invest from, how much to invest and the tax applicable to your investments. Each of these is dealt with ahead. Let us proceed on to Where to Invest. Direct Equity: NRI's can invest their funds in equity markets. But, before investing in equity one should take into account the time horizon of investment, risk and return expected on the investment and the long term goals. There is no limit or cap for NRI's investing in direct equity. Mutual Funds: A Mutual Fund would be a safer bet compared to direct equity for a foreign investor who has limited expertise. For an NRI, no specific approval for investing or redeeming from mutual fund is required. However, certain mutual funds may not accept deposits from NRIs based in the USA or Canada. If you are a USA / Canada NRI, it is especially important to first check the fund house rules before investing, so that money is not locked away for a few days before simply being returned to you rather than being invested. Real Estate in India is another favourite with NRIs. The clear benefit here is that while you are residing in a foreign country, the apartment / house can be given out on rent, thereby providing additional income. It is also a common myth that as an NRI it is not possible to get a home loan - an NRI can certainly avail a home loan to purchase a property in India. You must also keep in mind the taxation on your investments. *Indian Income means income which is received in India or accrues or arises in India. **Foreign Income means income which is neither received in India and does not accrues or arises in India. In the case of a Non Resident, only the income earned or received in India is taxed in India. Accordingly, income earned outside India would not be taxable in India. Dividends declared by equity-oriented funds (i.e. mutual funds with more than 65% of assets in equities) are tax-free in the hands of NRI investor. Dividends declared by debt-oriented mutual funds (i.e. mutual funds with less than 65% of assets in equities), are tax-free in the hands of the NRI investor. However, a dividend distribution tax (which varies for individual and corporate investors) is to be paid by the mutual fund on the dividends declared by them. A unit of a mutual fund is treated as short-term capital asset if it is held for less than 12 months. When the units in Debt Oriented Mutual Fund are sold (redeemed) within one year of being held by the investor, it is taxed under slab rates applicable to Individual. When the units in Debt Oriented Mutual Fund are sold after holding for more than a year, gains on such units redemption is taxable as Long term Capital Gains. Long-term capital gains on debt-oriented funds are subject to tax @20% of capital gains after allowing indexation benefit, or at 10% flat without indexation benefit, whichever is less. Indexation benefit is when the cost of the investment is raised to account for inflation for the period the investment is held. This is done by using a cost inflation index number released by the tax authorities every year. Let's say that you had invested Rs 1 lakh in a mutual fund on March 30, 2005 and redeemed these units at Rs 1.5 lakh on April 1, 2010. As per indexation benefit, according to the Cost Inflation Index levels announced by the government every year the cost of acquisition would be deemed to be Rs 148,125 lakh. Your long-term capital gain on this transaction with indexation benefit is just Rs 1,875. The tax liability thus would be Rs 375. Without indexation benefit, long term capital gain will be Rs. 50,000 and tax liability would be Rs. 5,000. Are the funds in the bank account from which you will be investing, obtained from Indian sources or are they repatriated (brought back home) from the country in which you are working? E.g. Are they your salary funds? In which currency do you want to hold the bank account? Do you plan to repatriate the funds in the account back into the foreign currency, in order to take it back to your country of work? Based on the answers to these questions, you can decide whether you need to invest from your NRE (Non Resident External) account or your NRO (Non Resident Ordinary) account. NRE Account: In an NRE account, your funds in foreign currency are converted into Indian rupees, at the rate prevailing at the time of transferring the funds from the account. The principal as well as the interest is freely repatriable or can be transferred to the foreign country. Funds in the NRE account can be freely repatriated. NRO Account: If you want an account to transfer Indian earnings, an NRO account is suitable for you. Foreign funds can also be deposited into this account. The interest income earned on in this account is subject to tax in India. The interest is subject to income tax deduction at source @ 30% plus applicable surcharge plus education cess. Funds in the NRO account cannot be repatriated abroad. In summary, there are many points to note when investing as an NRI, we hope this article sheds light on some of the common queries NRIs may face when investing.